Nvidia first introduced the GeForce GTX 200 series in the middle of June, where it announced two new graphics cards—the GeForce GTX 280 and GTX 260. At the time, both cards were introduced at high price points and in some ways it felt like neither product was doing enough to justify the price. The GeForce GTX 280 was the fastest single GPU card on the market, but it was occasionally outperformed by Nvidia's GeForce 9800 GX2 – a card that came in at around £100 less than the new flagship product. The GeForce GTX 260, at the time, was over priced at around £230 because the Radeon HD 4870 launched shortly afterwards at well under £200 and in many cases it actually outperformed Nvidia's second-fastest card. During Nvidia's second quarter earnings call, president and CEO Jen-Hsun Huang admitted that his company had "miscalculated" and "underestimated" the competition coming from AMD. Thankfully, for the sake of competition, Nvidia lowered the prices on both the GeForce GTX 260 and GTX 280 to make things interesting once more. Nvidia's partners started hitting price points just below the Radeon HD 4870 with their GeForce GTX 260 cards, which meant that the decision wasn't quite as simple as it was when the 4870 first launched. It ended up becoming a situation where neither card stood out from the other and both are now great options – it's just a matter of where your preference lies. Fast forward to last week and Nvidia quietly introduced a new GeForce GTX 260. In fact, it wasn't really Nvidia that introduced it – the company didn't so much as issue a press release; instead, it was left to Nvidia's partners to announce the new addition to the product stack. We didn't get our card until the eleventh hour, so rather than just rush something out, we felt it was necessary to spend a bit of time with the card in order to understand its positioning a bit better. There's no distinct name for this product in Nvidia's range, which is probably why the company hasn't talked about it on record a great deal. We've heard names like "GeForce GTX 260+", "The new GeForce GTX 260" and the "GeForce GTX 260²" thrown around but the card we've got today bears none of those names. Instead, BFG Tech has chosen to call its new range the GeForce GTX 260 Maxcore line. There are three products that make up the Maxcore range, which bear the familiar OC, OC2 and OCX branding and factory overclocks that go with those names. In fact, the clock speeds are exactly the same as BFG Tech's existing GeForce GTX 260 OC, OC2 and OCX cards. So what makes the Maxcore different? It's all in the silicon, as they say. You see, the GeForce GTX 260 is based on the same GT200 GPU as Nvidia's flagship but 48 of GT200's stream processors are turned off, meaning there are just 192 stream processors in the 'conventional' GeForce GTX 260. We'll spare you of all the gory architectural details—there's always our architecture analysis if you are interested in that—but cutting the number of stream processors also meant a reduction in the number of texture units as well. The GeForce GTX 260 had 64 texture units compared to the full-fat GTX 280's 80. 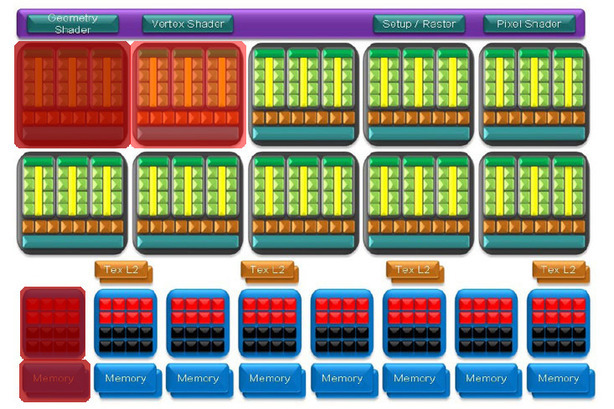 The number of ROPs was reduced as well from 32 to 28, which also meant that both the memory bus and memory size were reduced as well. These dropped from 512-bit and 1,024MB to 448-bit and 896MB respectively. The new GeForce GTX 260, then, is destined to confuse when I tell you there are 216 stream processors enabled on the chip. It's as if Nvidia has decided that its GT200 yields are high enough—or conversely its GTX 280 yields are too low—and the result is another card that sits in between them. For all intents and purposes, this should be called the GeForce GTX 270 because it's not a GeForce GTX 260 as far as I'm concerned. Initially, we were told that the 'new' 260 would replace the old and we'd eventually see the latter disappear from the market. That wouldn't be so bad, but it now appears to not be true though, because Nvidia has told us that the two SKUs will co-exist together and also share the same name. I hate to go on about how Nvidia has lost the plot when it comes to naming its products, but this is another case of exactly that. It does nothing but confuse customers and I really don't understand the motives behind such a move. BFG adds its spice to the GeForce GTX 285 and has created one of the fastest graphics cards we've ever tested. The GeForce GTX 285 OCX boasts impressive clock speed increases and promises a whole lot more - but will it live up to expectations? The last few weeks have been full of blood, sweat and BIOS revisions in the bit-tech benchmarking sweatshop. We've been feverishly putting our new Core i7-based graphics card test systems together and now we're here to report how the graphics landscape is reforming itself.